Well, things Have started "roaring" a bit to day. Its actually not really roaring, more howling. I'm in my first real gale right now!! Just a small one, with the wind about 35knots and some nice 10-15 foot or so waves. Its been cloudy and rainy all day long, but the sun came out tonight for a few minutes just before going down making a very pretty sunset. Its not exactly the type of weather for running around up on deck but it looked so nice out tonight that I suited up to go and take a 'quick' picture. I ended up out there for a good long while. It was very wet out there and before too long I was quiet drenched as my hood kept blowing off letting every wave that hit go right down into my jacket. So, I'm not exactly happy with all the pictures I ended up with but my fingers were too numb to push the buttons on the camera! After being outside for a while the 60 degree cabin feels nice and warm. Sixty degrees isn't all that cold but when it is when you've spent most of the past month in 100 degree weather, so hot you can hardly sleep at night. Going from that to 60 degrees in three short days really makes it feel absolutely freezing! But the nice thing about cold is that you can always put another jacket on! In answer to a question from the comments, no, I don't have an Eskimo suit :) But I have something close!! A survival suit. Its big, orange, like a full body life jacket and impossible to move in. Its for if I decide to go for a dip down around Cape Horn. As of now, I have no plans for using it, but just in case! I also have lots of different kinds of layers thanks to Patagonia. I even have some high tech wool that Steven Mann said was the best of all. As far as the weather goes, tomorrow will be the day to decide what course to take over the weekend. Tropical Storm Tomas that formed SE of Fiji is headed south and at this point if I am on a collision course with its mighty remains if I continue SE. The conditions where we are supposed to meet on Saturday night or Sunday morning are 50-60 knots of wind and seas to 30-40+ feet. I'm sure that Wild Eyes and I could handle it if we had to but if we can avoid it, we probably should. That isn't all that is going on down here. I still need to get south quickly after that system passes because there are more fronts on the way. For now I'm having quite a bit of fun in this gale. Everything about it seems so much better than a nice calm day (in its own way, calm days are nice every now and then too!) 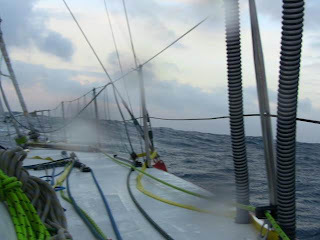 All the noise, the waves crashing over the boat and water getting right up to the window as we speed along! Patagonia is awesome! I love em! Glad to hear you are doing well. We are continuing to pray for you back in CA. I saw you family today at the roller dome. I like the flex conduit covering on the shrouds! Buckle in girl, the E Ticket ride is comin' your way. HI Abby... SOunds like you are really enjoying the Sail. Good fun if it doesn't get too wild. Be glad when you get around the Horn. Pick the right time to get in between those fronts. Have fun. This is a trip of a lifetime. Abby your an inspiration to us all. Whats the one thing (besides family)that you miss the most right now? Your in our prayers for a safe trip around the big blue marble! When you get home, may I take Wild Eyes around the world? What a blast you must be having! Thank you for keeping us up to date on OUR adventure! Thanks for your great report and "quick" photos. I hope you can stay "toasty warm" below riding out the conditions. I will be thinking of your safety tonight Abby. Sail on brave young lady. Abby girl, great pics as usual. The sunset in the last one overcomes the diamonds! Sounds like you are going to be playing a game of dodge ball (or dodge front) the next couple of weeks. PLEASE do not get in 50-60 knot winds with 30-40+ foot waves if you can possibly help it! We pray for you and care about you so keep the captain and crew safe. Just wanted to wish you well. The tropical cyclone certainly caused quite a bit of destruction and here in Australia we have one headed toward the Sunshine Coast of Queensland rather low down and tending to be a late season system. What with tsunami's and cyclones the Pacific Ocean has been a cauldron of unsettled seas. Happy St. Patrick's day and I wish you the luck of the Irish whilst sailing. Sounds like you are weathering the storm quite well. Thanks for the updated pictures. What an amazing journey you have ahead!! Good luck and have fun Abby! Have a safe trip and try not to do a 180 with the mast. May the wind be your servant. Where is the Bloop? We,ll be thinking about you. I've never been in anythig more than 50k. I don't think cyclones will go that far south. Take care and stay safe. I'm rooting for you! Abby: I just came across your Blog by accident. What an amazing young lady you are. I have a six year old daughter and I am teaching her to be strong, independent and fearless. I intend to read through all of your postings, so I can figure out when you will be back in California. I hope my daughter and I will be there when you sail in. I pass on your news to my students from time to time. Most can't even imagine what you're experiencing. Sounds like exciting days are ahead of you! Sending prayers for your safety. Happy St Patty's Day Abby. Stay safe Abby. God bless you. Love Patagonia!!! Happy St. Patrick's Day! Enjoy the cooler weather. Be safe Abby! My daughters 11 and 7 make it their first order of business when they come home from school to check on you! My youngest wanted to know if God would let you know we were praying for you. I asked why and she wanted to make sure He did because you're alone out there. She is trying to wrap her brain around that concept so it's been a great lesson on faith. I know I'm not the only parent out here concerned for you. We all want you safe and home with no major events. So sweet dreams and better weather! We really do hope you feel the thousands of prayers on your behalf. Patagonia gear is indestructible and warm! Glad to hear they kitted you out. Happy St Patrick's Day to you, Abby! Your photos are great and it's always a special treat to see a new blog from you. Avoid the bad weather as best you can and continue to let us know how you are - as often as you can. I am amazed at how fast you are closing in on the Cape. Good sailing, be careful, stay safe. It sounds like fun sailing in the Gale you are in now. Even though I haven't sailed anything more than a Hobie-Cat, with some experience and a boat like "Wild-Eyes", even 50 knot winds and 30-40 ft seas is an experience I wouldn't pass up given the opportunity. I'm not trying to encourage you to go that route, but just saying, that after making it through something like that, a person would never forget it, and man, would you have a story to tell! Just my rambling thoughts of the moment, and I realize it's easy to say when I'm sitting at my computer on the edge of the prairie, about as far from a substantial body of water as one can get in the USA. Just keep having fun, and continue keeping us posted. As always, my prayers are with you, and best wishes from the Black Hills of South Dakota. Thanks for another detailed report; you make us feel as if we are right there with you! You are just as talented as a writer as you are as a captain...and that's a huge compliment because obviously you are an outstanding captain! (We'll have an autographed copy of that book, please.) Also, we vote that you get to skip Senior English class altogether! :) In the meantime, stay safe and keep up the great attitude. Watching your progress and praying for you daily. Glad to hear you are doing well with the heavy weather! Sounds fun, but a bit cold. Best wishes from Wisconsin, where the inland lakes are still full of ice... no sailing yet. Skipper, nice entry on your quarter deck log, nice pictures too. Nice to hear that you are having fun out there. Again stay safe and dry and I look forward to your next entry. ....so-o-o everything good. I know you are a skillful sailor BUT, PLEASE take every precaution as you are staring bad weather systems in the face. 50-60 knot winds and 30-40+ ft seas sound incredibly frightening to this landlubber in OK! Precious one, please no risk taking! You have captured the hearts of many across this country and beyond. We are ever so proud of you and your dream. Your round-the-world goal is our goal also, BUT your safety and well-being is our primary concern. We love you! Sail smart, sail safe. SAFETY FIRST! It seems like it was raining.Wow you are brave and adventurous. I would freak out. Stay warm and dry dear. Shiver me timbers! What a salty dawg ye be! Like hearing the tactical jargon as you ponder up coming choices. A much anticipated forward look to the Horn your message brings. A thoughtful voice relays a hearty "bring it on". I want to tell you "You Rock". Your inner strength journeys through to the surface of your writing. I am mesmerized. Photos verify the rhythm of your thought. Each set you send feeds my curiosity, gives me a sense of our world in real time and I am grateful for all you are and give to us. Hey:)All the best for your journey! It looks so exciting..you know it's great that you are chasing your dream..never give up!Be safe. Hey Captain.Nice Photo.You doing good.Stay safe.From:Herman.Hampstead.NH.USA. Looks like you’re starting to get into all that ‘fun’ you’ve been talking about. I do hope you’re enjoying yourself, seriously. It looks like you’ve got everything under control, so just use your head and keep doing a good job out there. In regards to your explanation of the upcoming weather, I know you’ll make the right decision. With more fronts on the way, how big of a window do you have between storms? I noticed there were a number of good suggestions as to keeping your feet warm with the plastic (saran wrap) over your socks and then another pair of socks over that. Works every time. I hope you got your boots dried out. So enjoy yourself and have as much fun as you can handle, this is a chance of a lifetime taking on a challenge like this, and you’re doing a fine job. For a voyage that started out slowly it certainly has picked up in excitement, and with more to come, so take care and good luck to you Abby. I hope you have Charlie and Mr. Doggie anchored down. And a Happy St. Paddy’s Day to you and yours. Wishing you the best Abby. Be safe and be smart. I'm glad you and your team are monitoring the weather as closely as you can. You're an inspriration for many. When my daughter is old enough, I'll share your story with her. Make it a great one! This ought to warm you up; one used to be able to get a full driver's license at 14. No learner's permit, no restrictions at all. No adult needed in the car with you, night driving OK, no curfew, no limit on the number of kids along for the ride; you had the same license as a 30 year-old and insurance companies didn't penalize you one bit. That ought to keep you warmed up for quite a while. You were born in the wrong part of the 20th century. Having only one sailing experience by completing an Outward Bound program at Hurricane Island, ME, I can't even fathom the extent of your adventure and what you have set out to accomplish. I check your blog every day and I gain more respect each time for all the skill and character that you project through your very interesting comments. May the Force be with you! You are such a role model for all young women. Hi Abby, It looks like the adventure is really getting under way. If you do happen to run out of wind let us know and we will send you some of ours.We have a cat. 4 cyclone in the Coral Sea heading S>W. The national Surf Life Saving titles are due to start tomorrow and officials are worried the 24 ft waves might be a bit big for a safe carnival. Abby you are one brave young lady!!! From everyone's comments the Horn is an area that commands caution. What are the main areas on your trip that require extreme caution due to rough seas?? thanks for the photos and update! yes the weather systems and routing are significant factors you and Abby Team are guided by. Every best wish that they will pass further South. Like they say, you make your own luck ... nice to have a bit of help, too. you'll love (appreciate} this the "the flex conduit covering on the shrouds!" are in fact vents for the water ballasts! Those are some awesome shots! Your pictures are beautiful, you did well. I felt cold just imagining those waves hitting you. How exciting to see you getting closer to the Horn; your skills are showing, as you manage to guide your boat through those hills and small mountains of water. By the way, if you even noticed the comment about your "its" word, (which isn't worth paying attention to), you used the CORRECT spelling... the apostrophe is used only when the word is a possessive, such as "the boat showed it's true worth, making it through those rough seas"; we know you are very intelligent, and no one should critique you in the least! Have fun, brave one! Good to read your update and to hear that you are in a good mood despite the wind and the wet. Ths for the telling photo's. I like the sun set, such a good photo too. Sail safe and keep dry. Thanks for the pictures and all your comments...!! We enjoy very much to hear from you..! No more time to worry about any sorts of life forms. So is the howling foarty a male or female? Get south quickly, girl, so you can get back to the mid 30's where you belong, in time to miss the real weather. Thse storms are moving faster than 8 kn as they chase each other around the Southern Ocean. Weather maps are beginning to look scary, with some ever deeper lows. You're in my prayers for a safe sail. Hi Abby, you say you've got a bulky survival suit but have you got a yachting drysuit too? Good luck, stay safe! Such an interesting post from you today. I so look forward to hearing from you even if you only have time for a line or two. Sorry your fingers got numb taking the pictures. They are great pictures and I so enjoy them. Looks and sounds like you are really enjoying your voyage. I was on the ocean just once, a couple of years ago - on a whale watching boat out of Florence, Oregon. I was holding on for dear life. It was scary and exciting and a neat experience, but compared to what you are doing.....You rock, Abby. God bless you and watch over you. You're in my prayers daily. Stay safe and warm. Hope everything goes well and you weather the strong wind. Do not forget a Gale is wind from 35 to 40 knots but the Beaufort Scale is actually a measure of the sea state. The state is Moderately high waves of greater length; edges of crests begin to break into spindrift; foam is blown in well-marked streaks along the direction of the wind. Your picture don't capture that and landlubbers will not understand your situation thinking it is much worse than in fact it is. Happy Sailing, stay Safely snapped, Dry and most of all Enjoy Your Adventure! Beautiful photos Abby. Please take care of yourself and be safe. You are an amazing person. abby, the pictures are wonderful!.. looks like u r having the time of your life... i love the last one!. u be careful out there!. I am in awe of what you are doing, Abby. I've read about but never really done any sailing and think it's one very difficult thing to do. I can't imagine how one can sleep on a small boat in the middle of the ocean, alone, and in a gale. I enjoy your posts and wish you all the best. I mostly enjoy hearing about the howling and roaring winds and weather you're encountering and how you are managing the boat in them. Having more fun in a gale than on calm seas? Abby, you are an adrenaline person! In another post you said you have learned not to go on deck in this weather without your gear, even for a moment. Experience is a great teacher. I hope you stay teathered to Wild Eyes so you don't have the experience of learning what the line is for as you watch your boat sail away without you! Enjoy the trip, we are all cheering you on. What an adventurer you are. Good luck and enjoy the ride. Stay safe! I hope you manage to avoid those big storms coming up Abby. Wonderful pictures, especially of your happy smiling face. I sense a great deal of excitement in your words today. Enjoy the thrills but stay warm and safe dear girl. You are so special to many people following your adventure. Thanks for the interesting post. Sounds like things are going to be a little demanding for you for awhile. Nothing like a change of pace to keep you from getting bored. I'm enjoying your blogs. My daily morning ritual includes reading yours, then Jessica's, and for awhile, Katie Spotz. Now that Katie has successfully rowed across the Atlantic I only have yours and Jessica's to read. The blogs bring a little excitement to my life. Keep 'em coming. Another great post! Thanks for the awesome pic's. The sunset pic with the little diamond reflections is really, really cool and artsy looking. Don't keep that cabin too warm, it'll get like a rain forest in there, lol. It is amazing what you are accomplishing at such a young age and I am enjoying the ride with you. Thank you for your very descriptive report and beautiful photos. 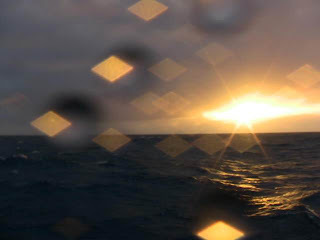 I love your sunset and diamonds photo. Remember that you are never alone. The Lord is right there with you and the rest of us are watching and praying for you. Always keep your eyes on the goal,stay vigilant, remember the things that you've learned and enjoy the journey. You are greatly loved. what I would give to just drop in on you and wild eyes,show me around play some cards.In my prayers. This is your time really enjoy it.Its your deal! Abby . . . the pictures are great! Especially the one of you. You look so happy and confident! I have always loved stormy weather . . . either sun or storm for me . . . it is the grey, just grey, that gets me down. What an inspiration to us all you are! Be well . . . be safe . . . and stay clipped in! Great pics, especially the sunset. Thinking of you daily. Good luck maneuvering the weather. Happy belated St. Patty's day. Hi Abby. Its really good to see pictures, thanks. Anyone who has sailed in 35 knots of wind knows that its no small task. Anticipating 50 – 60 would test even the most seasoned sailors. I check your blog each night and my thoughts are with you. Trust your boat and be prepared, I know you will weather the 40s and 50s just fine. I would have to agree that its best to sail around or away from the storms. All sailors know that eventually you will come face to face with one so just be prepared and keep safe. Can’t wait to hear from you next and I’m looking forward to reading about you passing Cape Horn. Awsome Abby. Take care Wild Eyes and she will take care of you. You Rock girl. He plants his feet upon the sea and rides upon the storm. May He watch over you! I've been smiling every time I read your responses to the decreasing temperatures - such as when it dropped down to the 70s and you had to wear a jacket. Here in Michigan, it's finally gotten up to the 50s and 60s so people are throwing off the layers of winter. I work on a college campus so I see kids walking around in shorts (crazy! ), but even stodgy adults are in short sleeves. It's all relative! And we'll be getting more cold weather in the next few months, so I'm sure I'll have more opportunities to commiserate with you. We wish you fair winds and a following sea. Thank you for braving the elements to take pictures to share. I always look forward to reading your blogs and your happy face is a really nice addition. We are enjoying reading your blog. Stay safe! Nice post and more good picures, thanks! One day, Abby, when we look up the term “Human Spirit” your photo will be there. Under what wind/wave conditions would you bare poles and deploy a sea anchor? THANKS SO MUCH FOR THE PHOTOS!! Happy Saint Patty's Day. you're doing GREAT Abby, "Keep it UP"
Hi Abby: You look cold down there in the roaring 40's. I hope you don't have to use your survival suit, but I'm glad to hear that you have one, just in case. Is your EPERB up to date? How many SAT phones do you have on board, and do you have plenty of batteries. Make sure you keep them dry. I'm a firm believer in redundancy when it come's to survival equipment, and lot's of new spare batteries. As I alway's say in closing; when topside and during angry sea's below, always stay tied off. We would hate to loose our Abby. P.S. Do you have equipment to strap yourself down , incase of a 90 or 180 degree knockdown? this is really cool, good pictures. this is really cool, great pictures. You are Extraordinary, Amazing, Talented and very Knowledgeable in your craft and a true inspiration to me and my family. Lot's of prayers being sent your way for continued safety Abby! Thanks for having us along Abby...trip of a lifetime even for us armchair old folk lol. Hi again Abby: The Bloop? Some bloggers where asking it's location. The bloop is a name given to an ultra-low frequency and extremely powerful underwater sound detected by the U.S. National Oceanic and Atmospheric Administration several times during the summer of 1997. The source of the sound remains unknown. It's located somewhere around 50 degrees S. by 100 degrees W., off the South American Southwest coast. what kind of heaters do you have? I normally don't comment on spelling errors "(which isn't worth paying attention to)", but please correct yourselves on the words "its and it's". Any dictionary will show you. Abby, Great to see a picture of you.You look well. Keep up the good work and you know we're here to help. I was wondering if Tomas would effect your route. Good luck threading your path trough the coming weather systems. I imagine some sailors delay the final push through the passage according to the forecast. @Steve in California ... I think you'll have to eat crow on this one ol' buddy. Non sailor dude's answer seems much more plausible especially when you see the shrouds in front of the flex tubes in the pic. :-) On a different subject, was wondering where the engine exhaust exits as I've never seen a visible exhaust pipe. Underwater? @non-sailor dude: Hey, for a non-sailor you sure gave me the skinny on the vent tubes. Thanks. Obviously, I didn't recognize them. As far as I'm concerned internal water ballast is an oxymoron. The water is suppose to stay OUTSIDE da boat. What a great morning for me. As usual I go diectly to your blog as soon as I fire up my computer and Voila'!, the first thing I see is this beautiful young girl staring at me with big shinning eyes and an infectious smile. An earlier post said it perfectly, a fair maiden, a fair maiden indeed! Great pics Abby. The sunset with the diamonds was just awesome as well. Please stay safe young lady and out of those big storms even if you have to stall the boat or back track for awhile. I know you could handle them, but I don't think all of us (your blogger family) could! @Perry West Hills CA 7:48AM regarding Human Spirit. GREAT comment. @Non-Sailor Dude 11:27PM....thank you for explaining what the flexible hose looking tubes are. I had seen them in an earlier pic and asked if anyone knew what they were since I had never seen anything like it on a sailboat. Abby may God continue to shed His Grace, Love and Peace on you. Enjoy your wild ride on Wild Eyes. Can anyone tell me why I have that little delete icon next to time designation on my posts and how I could eliminate it. Commonly engine exhaust is through the stern of the boat. My bet is on that small round stainless port on the starboard side of the escape hatch. and here in the pics of Wild Eyes in her original incarnation as BTC Velocity. BTW: The BTC photos (link to "The Yacht") show very interesting construction photos, as well as photos of her first roll over test. Hi Abby, I just discovered your blog, and It is great. You are on a great adventure and I look forward to following it the whole way. I wish you all the best, and stay safe. Such big waves Abby! It certainly sounds like you're enjoying everything "out there". You are such a brave young lady. I love your blogs and photos. Keep safe and God speed. You are such an inspiration! I really enjoy reading your blog and following you on a daily basis. All the best! Thank you for keeping us updated Abby. You are a very brave girl who can make any father very proud and worried at the same time. Keep safe and warm. We'll be standing by as you reach Cape Horn. GOD SPEED. Hey guys, the ballast system with the vent tubes works great. It is designed to put sea water ballast on the high side (up to 1200 gallons) in order to keep the boat upright as possible. This allows Wild Eyes to milk a few more knots of speed when needed. The water intake for this system is both passive (a scoope that drops down below the hull) and active (a Jabsco 1-1/2" belt driven pump). When the ballast is full the water shoots out the top of the ballast vents like a water cannon. Wow! !numb fingers and all..Thanks for braving the weather and the wet to share it with us..Stay warm..no hypothermia for you..okay? And while you said the wind is howling and growling..and blustery..uh..er..inferrred from the splash and overflow...you didn't say what we all want to hear you say..even if you are in a floating suit..you will be tethered and clipped on..right? I like this blog. You seem to be a real ocean sailor who love sailing and don't mind some bad weather. Keep up the good spirit! According to my calculation there is 1366 nm to Cape Horn with estimated arrvial on March 29. For those who think 60F (15C) is warm, with the windchill and moisture, it is not so nice. You are the only one that can see the icon on your post. Each one of us sees it on our own posts. The purpose of it is the be able to delete your comment if you change your mind after you've already posted it. Just how thoughtful is our young Abby. Great blogs, keep it coming and the pictures too. What are those two corrugated (flex?) tubes attached to the life lines? Hi Abby, my first post but I have been following you from day one, as I did your brother. Besides being a fantastic sailor, you are a wonderful writer, and along with your photos, you allow us to sail with you vicariously. Remember, "one hand for you and one hand for the boat". Stay safe!! You are a little cheater: you look all sweet and quiet... and you are a sea wolf, happy in the gales, and the way you say that you should avoid the remaining winds of Thomas lets me think that you are regretting it!!! Naughty girl!!! No, brave girl and strong sailor!!! Being careful is not a bad option, of course... Less challenging for you, but probably better for Wild Eyes... You seem to trust her, and that's good, but a real nasty system might break some important piece somewhere. Thank you for your blog and pics... Keep always tethered, and if you don't have enough pleasure with the stormy systems, you are allowed to attack the chocolate's bag! "Sixty degrees isn't all that cold but when it is when you've spent most of the past month in 100 degree weather"
Sounds like Texas every month, because there are no months. It is the bipolar weather state. Green rope; you mean green line right? Well, OK I'll give it a try. It appears to run through a small block attached to the base of the stanchion, so it can't (or should) be carrying much load. It also appears (in the blur of the photo) to run forward to the roller furling base of the stay sail, so....I'm going for ...ta da...it's the stay sail furling line. What that has to do with Abby being thoughtful is beyond me. I've been dead wrong once today; let's see if I can go for two in a row. Opps...wait, wait, don't tell me! Green line. St. Patrick's Day...could be, maybe, huh? Hello from Kodiak! Sounds like you're getting some of our weather down there. The kids will be back next week; we'll catch-up on your journey when they return, they've been out on Spring Break. Blessings to you on your roaring adventure. Hello Abby, I read about you in the Ventura County Star and saved your blog address. I am ecstatic to read of your progress! It all sounds wonderful! The stories you will have to tell - thank you for keeping your journal. I wish you God Speed - Sincerely,a teacher in So. Cal. God Speed Abby! Be safe. Abby, I am thinking about loose gear right now. It was always my downfall; such that some companions referred to me by that name. During the next few days you need to locate and secure all these potential "missiles." Even the small things rolling hither and yon can be disturbing if not dangerous. Yeah, I know, you already did that... check again...please. You are living the dream. The sea in your face. The wind at your back. Can't get that in a cubicle. Fair winds and following seas Abby. Hi Abby. I wonder how your day was. I read that you were about 262 miles north of the Bloop. Because I had no idea what that was I looked the word up and learned there is an ultra-low frequency sound detected that is coming from that area and that NOAA scientists have not determined the source. There are so many things to learn about the planet we live on. We had a beautiful blue sky day up here in the NW today. I finished my exams and believe I passed. It is Spring break now. My thoughts and prayers are constantly with you. Just kidding of course. I know you will be fine. Keep up the good work and stay dry. Have been super busy lately and I'm just checking in on you. Sounds like things are going smooth for you. Hopefully the next few days will stay just as smooth. Glad to hear you have some cooler weather ours is finally starting to warm up, if you call 40 degrees warm! Love the pictures! It must be awesome! You take care and sail safe! My daily routine is not complete without checking to see the progress the markers on the map have made as Wild Eyes and her skipper make progress on their adventure. 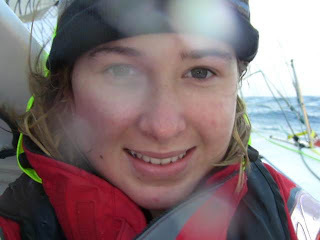 I was obviously born many years too early, and habour a real envy of Abby, her brother Zac, the UK's Mike Perham and Australia's Jessica Watson. I wish there had been such role models around when I was in my teens - but they manage to inspire me even at my age . . . although towards slightly less extreme adventures. Wishing you a fair wind and kind seas! This is really inspiring; thanks so much for sharing your dream! I loved your pictures, by the way.... Happy St. Patrick's Day! What kinds of music do you listen to on your boat? Stay warm and dry and above all be cautious, I do worry about you, as do many of your faithful followers. From my ‘unprofessional’ calculations I figure you have less than 1700nm’s to go to the cape, or roughly one (1) week. Do you have an itinerary that you would share with us, or is that to be kept quiet for now? Just for the record, I wouldn’t care if you spelled all your words backwards, or missed a dozen apostrophes, as long as we hear from you. @ Steve in California: Thanks for the link on the construction of “Wild Eyes” Very interesting. Take good care of yourself and the crew, looking forward to your next post. Greetings Abby. I have been following your blogs from start. You are living a dream I have yet to accomplish. Wild eyes is a beautiful vessel !!! I have time on the ocean = berring sea, gulf of mexico but on large crabbing vessels. I know what 30 ft seas feels like on a 90 ft vessel. The rougher the weather, the more I like it. I would like it more on a 40 ft sail boat. I think it brings you closer to the ocean and mother nature in a sail boat. Be safe Abby and may the wind fill your sail. Horse head for default pic. Hi Abby!! So enjoyed following your brother - and now we're hooked on you! !Great pics!! Stay warm and safe..All your fans are sending you good thoughts and prayers!! I am 1000 miles from the Cape this morning 20/3 03 GMT in good westerly winds mid 20's. Anonymous asks "what is The Bloop?" The Bloop is the name given to an ultra-low frequency and extremely powerful underwater sound detected by the U.S. National Oceanic and Atmospheric Administration (NOAA) several times during the summer of 1997. The source of the sound remains unknown. origin at about S50 W100. great job, I hope you are gonig be safe. I just want to ask you, if it is possible to add night sky photos.